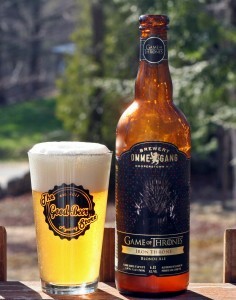 This beer got a lot of press when it was announced as Ommegang partnered with HBO to offer a beer based on the hit series Game of Thrones. I am big fan of the series and have listed to all 5 audio books so a beer that taps into that marketing seems like a great idea. The beer is a Belgian blonde ale which is not terribly exciting but I saw someone post that being a “gimmick” beer you might get some cross over from not craft beer drinkers and it makes sense to do a blonde and not something bigger. That way you don’t turn off those that are not used to craft beer. I thought this was a good explanation of why Ommegang chose a blonde ale and I wish I could remember who said it so I could give them credit. Overall this beer is what you would expect from a Belgian blonde, nice light color with thick white head. Belgian yeast and spice dominate the aroma. Taste was average nothing spectacular but certainly worth trying with some lemon, floral and peppery spice. Overall a solid beer with some smart marketing. Brewers Description: Brewery Ommegang and HBO are partnering on a series of beers in support of the critically-acclaimed drama Game of Thrones. Launching in tandem with the season three debut, Iron Throne is the inaugural beer in the series. Iron Throne is a blonde ale at 6.5% ABV and brewed with a robust amount of pils, honey malt, aroma malts and red wheat. Gentle hopping includes Styrian Golding and Hallertau Spalter Select, appropriately noble hops. Spiced with grains of paradise and lemon peel. Hue is a slightly hazy golden amber. Head is full and fluffy. Finish is crisp, backed by a touch of spice and hops. Aroma is a bit grassy with a hint of lemon fruitiness from the lemon peel. Taste is lightly malty, rounded out by honey malt sweetness.